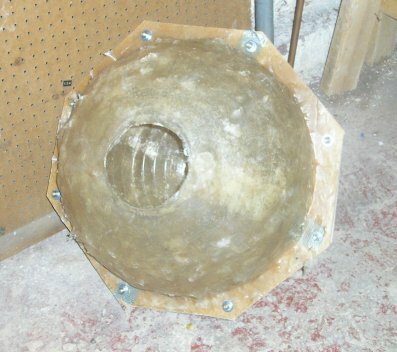 This document is the end result of some experimentation with fibreglass moulds (or molds for our American friends). I had never worked with fibreglass beyond basic bodywork, and certainly nothing on this scale. 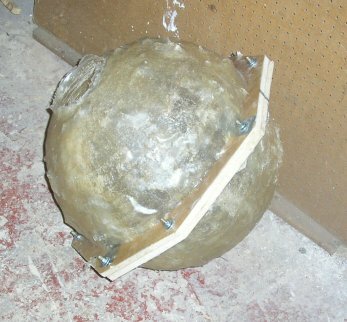 After fruitlessly searching for a pre-made mould that was large enough -- and driving the folks at Home Depot nuts asking about BIGGER globes for light fixtures -- I finally took a cue from the mould pictures on Jackal's Gym. I've never actually seen those moulds, but I'm pretty sure that mine are identical. I've tried to include every step. This means that there may actually be more detail than the average person needs to complete the project, but hopefully sufficient detail that the total construction newbie can also finish. 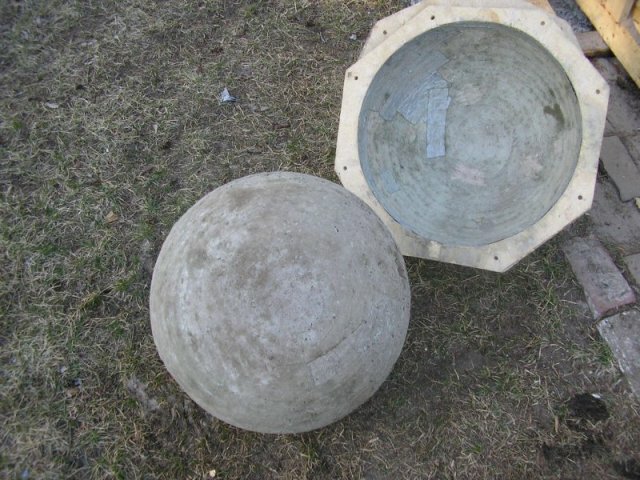 *** Please note: I wrote this article long before Steve Slater made his Atlas Stone Moulds. 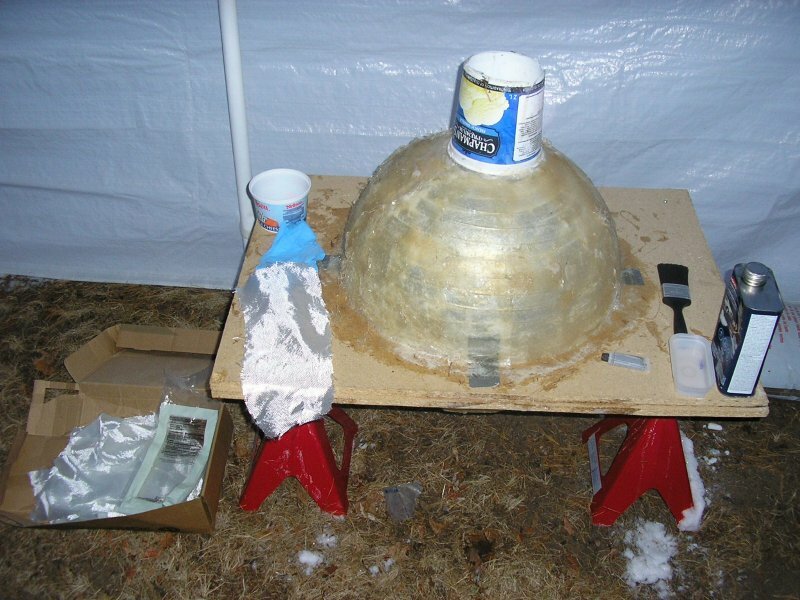 It is a LOT easier -- and cheaper -- to buy your moulds from Steve. They are available at: http://www.slatershardware.com/stonemolds.html. For those who prefer a challenge, keep reading! Exactly how big do we want to make our moulds? Let's assume that our stones will be 100% concrete, keeping in mind that the density of concrete is approximately 142 lbs per cubic foot. To save some time, I've written the two calculators below. Enter either the desired radius (keeping in mind that radius = half of diameter) in the upper calculator, or the desired weight into the lower calculator. When you have arrived at satisfactory figures, note down the relevent radius or radii for the next step. Enter radius of stone in inches: Stone weight: pounds. Enter weight of stone in pounds: Atlas stone radius should be: inches. Measuring from the center of the pivot hole, mark the appropriate radius measurement or measurements from Step 2. Try to space them at least 1/4" apart. place pencil in appropriate hole, scribe circle. I used chewing gum to keep the pencil in place. cut out with jigsaw. To prevent wood expansion from water, I recommend treating the exposed inner surface of the plywood with a water-repellent coating. 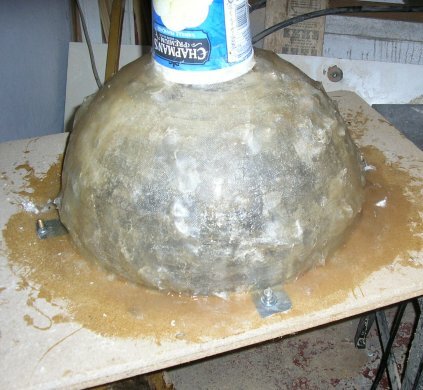 How much fibreglass mat do I need? Well...time for a bit of math. Therefore, we will need an absolute minimum of 7.9 square feet to totally cover our sphere for one layer. 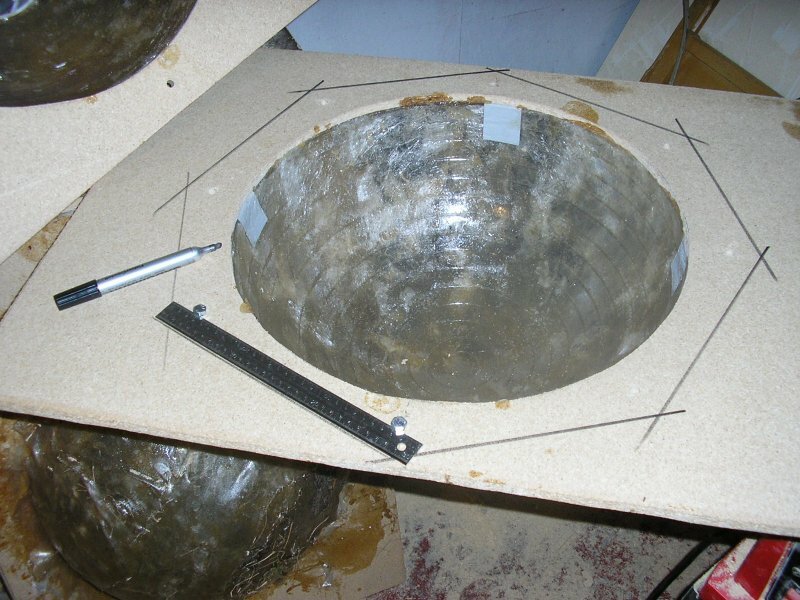 However, sections must overlap, and there must be some fibreglass mat on the wooden form, so just to be safe, let's assume an overage of 50%. Rounding up, we will need about 12 square feet of fibreglass mat for each layer. 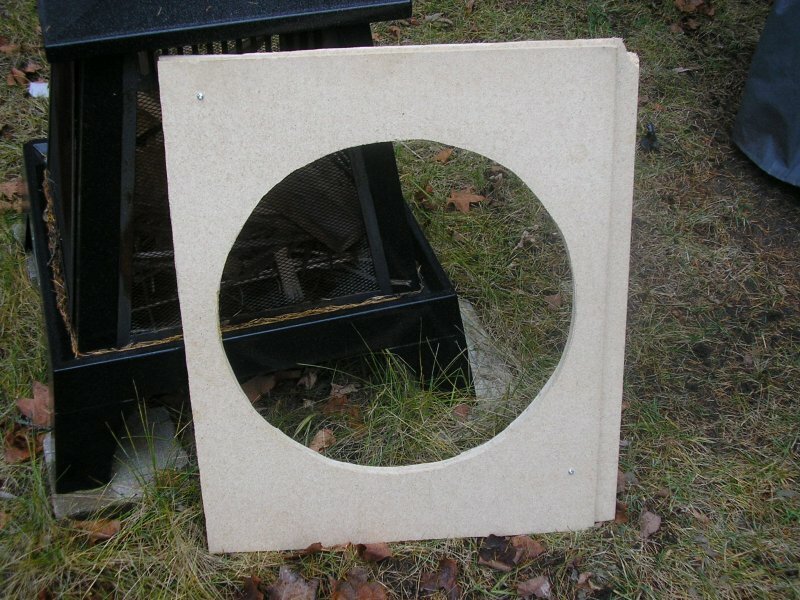 Stone radius in inches: You will need square feet of fibreglass for one layer. Be careful! Resin heats up considerably as it cures - do not get any on skin. 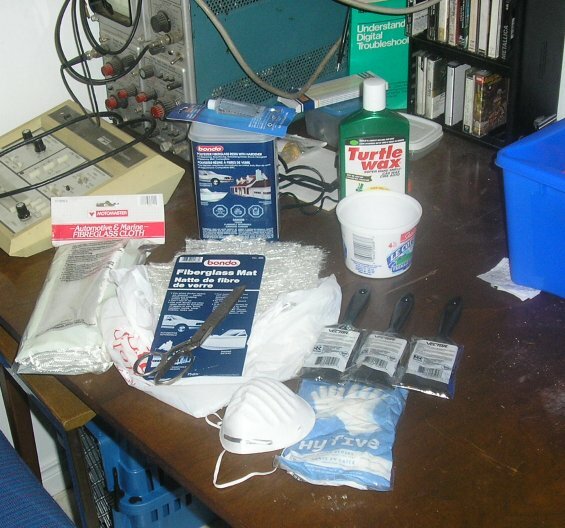 Remove/clean up with acetone. With form still bolted together at the edges, drill four holes about 1” out from the perpendicular mould surface, at the quarters. Midway between these, drill another four holes. 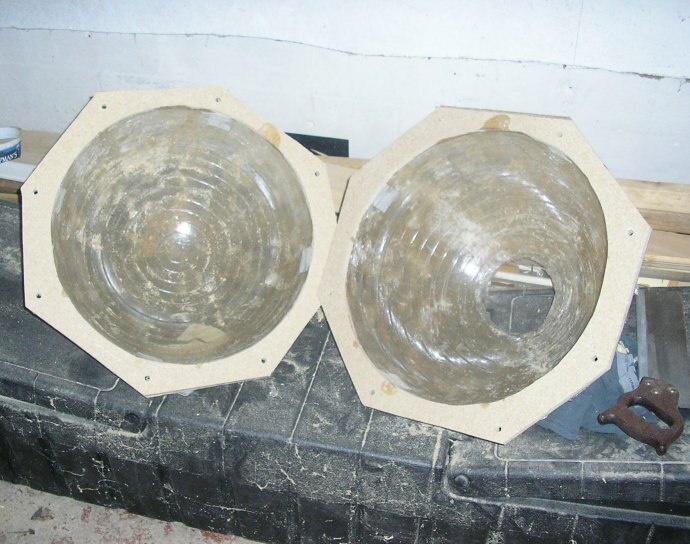 Remove the bolts from the edges, and seperate the mould. Scribe reference lines on each inside surface between a bolt hole and the circular mould cavity to remind yourself how it lines up again. Working on the inside surface, drop bolts into two adjacent holes. Pull the bolt heads up slightly and place the straight edge against them from the outside. Scribe a line. Pull up one of the bolts, place in the next adjacent hole and repeat until you have an octagon. Repeat this process with the other half of the mould. Use a circular saw or a jigsaw to cut along lines. Clean out inside of mould with compressed air or a vacuum. Go over inside surface with fingers. If any cavities are found, outline them with a felt pen. If any bumps are felt, mark them as well. 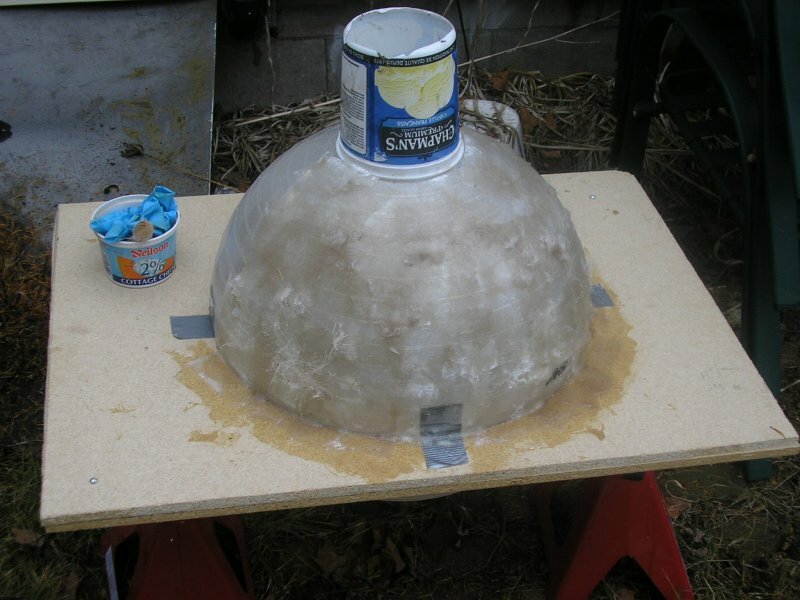 Fill the cavities with Bondo or bodyfiller. Carefully sand down the bumps until a smooth surface is achieved. 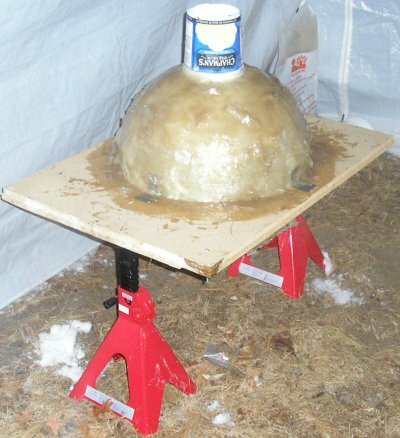 Wax the mould before each use, and apply a releasing agent -- preferably a mould release, but cooking spray (i.e. PAM) or light duty machine oil (just a light film - wipe up any excess) will have the same effect. You may also want to apply a very light bead of silicone seal on one lip of the wooden form to make a gasket. Bear in mind that this mould must be packed in sand -- fully surrounded by sand -- before pouring. The sand will help stop the mould from expanding outwards and seperating from the wooden form when concrete is added. 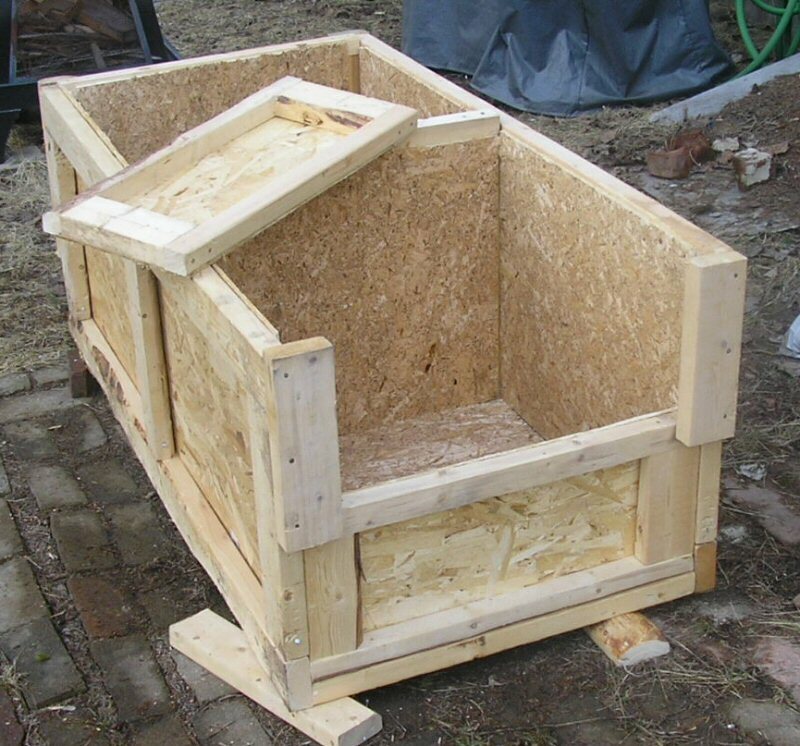 A garbage can may be used for smaller moulds, while a custom-built box may be required for larger moulds. If making a custom box, remember that a stone in excess of 300 lbs will have to be removed from it without causing any damage to the mould. 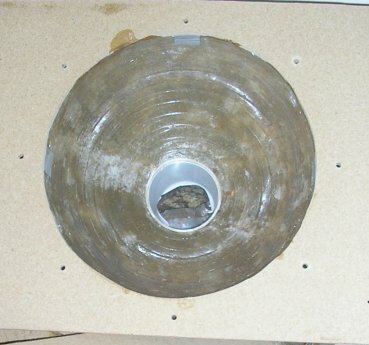 Try to make a two-tier box, with the top half able to be lifted off to remove sand and expose the bolts to remove the top section of the mould (see below). Include a bar across the top opening to suspend lead weights. DON'T try to lift a filled mould by the wooden form section. It WILL break. 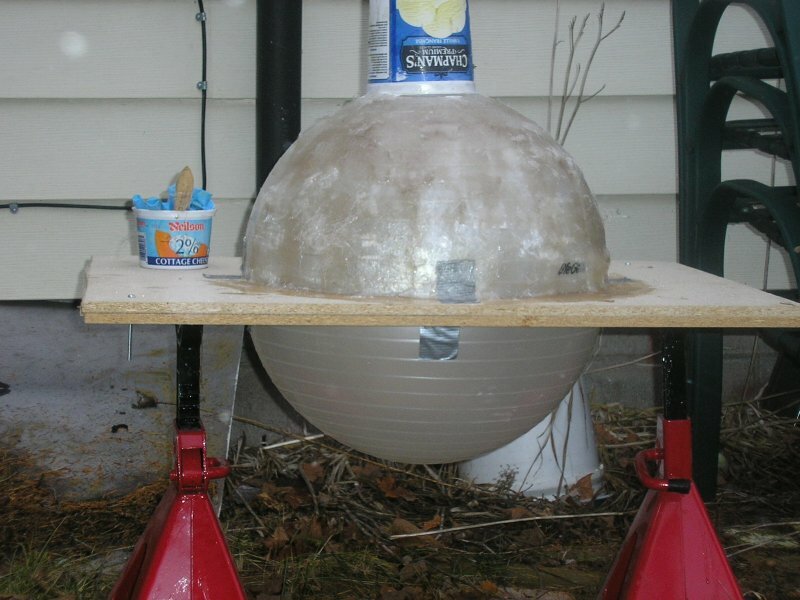 To make your stone lighter, place foam balls in the center. Try to vibrate your stones for as long as possible. More air bubbled out of the concrete means a smoother, heavier stone. Fill mould 1/3 full, then vibrate the mix using a palm sander and a length of pipe to transmit the vibration into the mix. Move the pipe around and vibrate until no more air bubbles rise. This will also cause the coarse aggregate to rise, and the finer aggregate to sift downwards/outwards. Add more concrete and repeat. Seven years after I made my set of stones, they have been used in countless competitions and in training, have been dropped on a multitude of hard surfaces (and onto each other) and have sustained no damage. The creation of two moulds and four stones was a long, backbreaking project that I don't want to do again; I purchased my 385 lb stone several years later from a friend who had Slater moulds. However, it was fun to do at the time, and for those who may live in remote areas of the world, or who have a lot of spare time and supplies available, it may be a viable option. Good luck! Grant Buhr is an active strongman competitor, and is currently the Executive Director of the Ontario Strongman Association, as well as the webmaster of ontariostrongman.ca. Copyright (c) 2004, 2005, 2010 by Grant Buhr. All rights reserved.